The most important thing about choosing recipes which help and not hinder your exercise regime is to remember that if you are doing more exercise, you will need to make sure you eat well. It may be tempting when trying to get fit and/or lose weight, to think that if you exercise lots and eat very little, you will achieve your goal. However, this is dangerous because you will not be giving your body the fuel it needs to do the exercise and you will run the risk of fainting or worse as you exercise. The important thing to remember is to steer clear of saturated fats but take on enough calories that you will actually be able to do the exercises and carry out your day to day life. If you are planning to exercise fairly intensively, then you will need to make sure you are taking on plenty of foods from various food groups – especially carbohydrates and protein, for energy. Salad may look healthy, but mixed leaves will not provide you with the necessary food groups for successful exercising.Follow some basic recipes, below, for a healthy diet. As a general rule, pasta is a good option – wholegrain if possible. But steer clear of creamy sauces and stick to tomato-based ones. Jacket potatoes are also a good option as they release energy slowly rather than all in one burst, and eggs in moderation should be added to your diet as well. Do remember to eat plenty of fruit and vegetables as well, and think about cooking techniques. Steaming is better than frying, as is boiling or grilling. Heat the oil and fry the onions, garlic, mushrooms and red pepper until softened. Increase the heat and add the minced beef. Cook until it has browned and then turn the temperature down, add the tomatoes, puree and oregano. Season the sauce mixture well with salt and pepper. Cover with a lid and simmer for about one hour until it is rich and thick. Remove from the heat while you cook the spaghetti in boiling salted water. 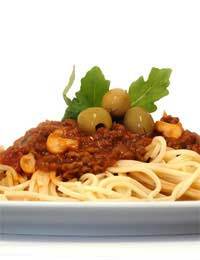 When cooked, put the spaghetti on plates and a good helping of the bolognese sauce on top. Serve with a little Parmesan cheese if required. Prick potato with a fork and bake in a pre-heated oven 200 degrees C, gas mark 6 for an hour or until a knife slides in easily and the skin has crisped a little. In the meantime, drain the water from the tuna and mix together the tuna, onions, peppers and sweetcorn. Stir in the yoghurt and mayonnaise and mix. When the potato is cooked, slice it in half and serve the tuna mix. Heat a little oil and saute the tomatoes, garlic, onion and mushrooms until softened and then add the lemon juice and dill and remove the pan from the heat. Cook the rice according to taste and type of rice. Grease an oven proof dish with some oil, spread the cooked rice over the bottom and arrange the salmon fillets on top. Brush the fish with olive oil, cover with foil and bake for about 20 minutes in a preheated oven. Remove the foil and cook for an extra five to ten minutes until the fillets are browned on top. Add the vegetables to the dish and serve.